Nepal is synonymous with mountains and trekking as 8 out of 10 world’s highest mountains are located in Nepal. With rich natural landscapes, astounding vista of mountain peaks and cultural heritage on offer, it makes one of most sought after destination for the trekkers as well as culture seekers. Trekking in Nepal comes in wide gamut from moderate to strenuous gradation level. For modest trekkers to serious one there is all for everyone. For serious and seasoned trekkers scaling mighty Mt Everest still govern their bucket list. 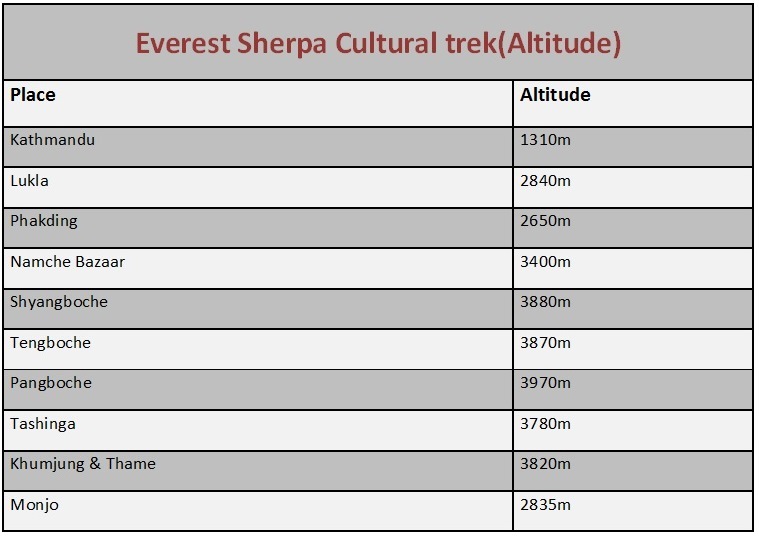 And relatively moderate trek like Everest Sherpa cultural trek easily qualify even for modest trekkers. Everest Sherpa Cultural Trek traverse through many villages, an opportunities arises to tread on the same path as with locales comes more often than not. To delve deeper into indigenous colourful cultural theme in different villages are prime, so are interaction with locales who radiates warmth and friendliness. Most importantly, you can have astounding view of mountain peaks, and unconditionally ringside view of mighty Everest from Namche Bazar Shyangbuche and Tangbuche. Altitude for Everest Sherpa Cultural Trek. In Himalayas, altitude typically influence the weather of the place. On a trekking day, there could be a great deal of altitude gain and loss. However on this trek particularly, it is lower than 4000 m in any place. Travel light is the phrase which we often hear in our trade.. However, there are many aspects to consider when we prepare for trekking. One singular most important consideration that dictates our welfare is how to be suitably equipped to combat with elements of nature that we may come across like inclement weather and rugged and unforgiving terrains whilst on trek. Though our intent is to provide check list with appropriate information however we ask you to examine and exercise discretion in most resilience manner based on your own outdoor experience and preference. On a clear, sunny day, the sun burnt will be an issue, at altitude, the sun rays are particularly strong. Bring a hat that shade your head, face and neck from the sun and also consider using Arab type scrap for further protection.You should bring a plentiful supply of sunscreen cream and a couple of large tubes of factor 6-10 (depending on your skin sensitivity). At altitude, the sun’s rays are particularly strong, and sunglasses with 100% ultraviolet and infrared filtration are recommended, . These glasses are available with detachable leather or plastic side pieces, which give increased protection. Make sure they are dark enough to keep your eyes comfortable on the brightest day. Bring a good headlamp for this trek. It should be bright enough to use on the trail if we have a day that is longer than usual, an early start for the trek or for reading in your lodges in case there is power outage. L.E.D. headlamps are sufficient. Make sure you bring at least 2 extra bulbs and extra batteries. Liner Socks (2 Pairs)- If you prefer to wear two pair of socks your inner liner socks Liner (A thin wicking sock that repels moisture. Liner socks help to reduce the likelihood of blisters. The socks should be thin wool, nylon. NO COTTON. Hiking Socks ( 3 pairs) – You should bring a thick woollen sock to use as an extra layer over the liner sock or some may prefer to wear just the hiking sock, in such case ensure it’s thick mainly natural fibres and of loop stitch construction for maximum warmth and comfort. Hiking Boot –This is one of the most important considerations, as blisters and sore feet will spoil your trek. We recommend that you take a pair of light to mid weight trekking boots, well broken -in, provide good ankle support and suitable for walking over rough terrain and comfortable over long distances. Good quality fabric boots are recommended. Gait ers: Gaiters are an important piece of equipment, which will help to keep your feet warm and dry in wet condition. The simple â€œalpineâ style of gaiter which hooks onto the bootlaces and is held under the instep by a strap or lace is fine for most trekking applications. A mid to heavier weight thermal layer. Fitted, light-weight and quick drying. As we recommend to adopt the principle of “layering” this light to mid weight top can be used as base layer. Warm Jac ket –As it can get cold during morning and night specifically at lodge. You should incorporate a Polar guard or fleece jacket. This can be a very warm fleece or Polar guard jacket. Full zip is recommended. Shell Jacket –As its highly unlikely for the rain during the trek or over the period of time but unpredictability of weather in Himalayas are renowned. To be equipped for any rain whilst on trek the shell jacket is advised. Shell garments made from breathable fabrics (GoreTex or equivalent) are recommended. D own Jacket –This is certainly not optional for the trek. This is what will keep you warm at higher region and at night. Light or mid-weight (2 pairs) A light or mid weight thermal bottom base-layer that will get you through a wide range of temperatures. Warm pants – A pair of comfortable fleece or similar material warm pants are great for colder places and camping at night. Shell Pant– As its highly unlikely for the rain during the trek or over the period of time but unpredictability of weather in Himalayas are renowned. To be equipped for any rain whilst on trek and also from the cold wind the shell jacket is advised. Shell garments made from breathable fabrics (GoreTex or equivalent) are recommended. Day pac ks – A 2500 cubic inch pack should be large enough to carry the following items on trek. a) shell jacket and pants. b) fleece jacket, pants, extra pair of socks etc) Two water bottles, with at least 2 quart total capacity. d) camera plus accessories, binoculars, etc. e) first aid kit. You should test-pack your day pack before leaving home. Duffel Bags (2 nos) – You’ll need one large duffle bag to hold everything, you do not put in your day pack, including your sleeping bag and mattress, while on trek. This bag should be durable, as it will be carried by porters and/or pack animals. A second smaller bag can be used to store items not used on trek at the group hotel. Sleeping Bag You will need a 4-season sleeping bag rated to at least zero degrees. A full-length side zip is essential to facilitate ventilation on warmer nights. A cotton or fleece liner adds to the warmth and comfort of a bag and prevents it from becoming excessively soiled. Sleeping Mattress – A mattress is needed primarily to insulate you from the cold ground, and you should take a quality closed-cell foam mat .On all camping treks, we provide light trekking mattresses. However, if you care for extra comfort and have a sensitive back, bring a self-inflatable trek mat. Trekking Poles –Trekking poles can be good if you need extra support for your knees and/or ankles. Must be collapsible poles. Make sure that they are durable, lightweight + easily adjustable. Underwear – (men- polypro boxers or briefs / women- poly-pro sports bras, cotton or polypro briefs are fine) 3 rotating pairs. As with socks and shirts, you’ll be wearing one, one will be drying from washing and one will be clean and packed. Sleeping Bags Liner: Sleeping bag Inner liner made of fleece or cotton is highly recommended that can be easily washed and dried while in the trek. Most importantly it provides additional warmth, if the temperature should drop and keeps the sleeping bag clean. Pillow: Small blow pillow is provided. However you may consider bringing your own comfortable small trek pillow. Please try to keep the weight of your equipment to a minimum. Choose items of clothing that can be used in multiple situations. On the trek, you will be carrying your day pack loaded with just the items you will need during the day .Your packed trek/duffle bag will be carried by pack animals (ponies or potter) and should weigh no more than 13 kg. Although Everest Sherpa Cultural Trek is a moderate trek with no technical skill requirement however a prior conditioning like jogging, exercise, yoga and physical activities will always stand in good stead in term of enjoyment of trek. A hike of 3 to 6 hrs daily with day pack, in addition varying degree of ascend and descend may require to be physically fit to a fair degree. Having said, its important that you consult with your doctor if you have pre-existing medical conditions such as heart, lung, and blood diseases and also inform Service Provider (Wind Horse Tours). The best time for doing Everest Sherpa Cultural Trek are Spring and Autumn. Spring fall between (March -May) and Autumn between (mid Sept – mid December). Weather are great with clear sky and bright sun, affording grand vista of far off mountain peaks and landscapes. The average temperature during day time can range from 10 to 18 degree celsius but at night it may drop down below freezing point. During winter( Jan – Feb), it is very cold especially at higher elevations.Average temperature during daytime can range from 3 degree celsius to 10. Night time it plummets below freezing point. from However, day are relatively warm with bright sun. Most importantly, its less crowded. Monsoon (June – August) spells rainfall but it bring lush greenery and varied wild vegetation – Botanist’s delight. Average temperature during day time – 12 degree to 22 degree celsius. Potential Health Risk during Trek. Even if you are in pink of your health, there is always risk of running into sickness. Main culprit is contaminated water and food. If you are careful, you can easily prevent these problems. 1. Fever -If you have a sustained fever (over 38°C) for more than two days while trekking and you cannot get to a doctor. An emergency treatment is a course of the broad-spectrum antibiotic azithromycin (500mg twice a day for seven days) but seeks professional medical help as soon as possible. 2.Diarrhoea – The main cause is due to contaminated water, food and lacking hygiene. Ensure you have anti-diarrhoea medication such as Lomotil, Imodium and broad spectrum of antibiotic like Azithromycin or Norfloxacin. Stay hydrated as much or take ORS in acute case to avoid dehyradtion generated due to infection. If the infection is severe and if it’s accompanied by mucous or blood and cannot reach doctor in trek. In such case, the recommended treatment is norfloxacin 400mg or ciprofloxacin 500mg twice daily for three days. These drugs are not recommended for children or pregnant women. The preferred treatment for children is azithromycin in a dose of 10mg per kilogramme of body weight per day (as a single dose each day for three days). or acute mountain sickness (AMS). If allowed to develop unchecked, AMS can lead to coma and death. However, you can avoid this potentially deadly condition by limiting your rate of ascent, which will allow your body to adjust to the altitude. There is also a 100% effective treatment if you do experience serious symptoms: descend immediately.The onset of symptoms of AMS is usually gradual, so there is time to adjust your trekking schedule or retreat off the mountain if you start to feel unwell. Most people who suffer severe effects of AMS have ignored obvious warning signs. Dental Care – Have your dental check up done before coming to Nepal. As there are very few highly rated dental clinics in Kathmandu and on trek. Clothing- Your clothing needs to be adaptable to suit a wide range of conditions, including extremes of weather and varying levels of physical activity. We recommend to adopt the principle of layering which involves the use of several thin layers of thermally efficient clothing, which can be worn in a number of combinations, according to the prevailing circumstances. Where it is warm enough you can trek in either shorts or lightweight trekking trousers (natural fibres) (a long skirt is an option for the ladies) and a long sleeve cotton shirt or T-shirt. For colder conditions, you can add layers of thermal clothing. And that the clothes you bring wash well in cold water and dry quickly. Hotels: Accommodations in Kathmandu are in 4* hotel. However in Trek, for 6 nights you will be staying in upscale lodges and 2 nights in Pakding and Namche Bazar will be basic with attached bathroom. Food: Kathmandu have some choices for eating out. It is best to stick to diets that are cooked well, instead of eating, raw or semi-cooked food to avoid any stomach problems. Food on Trek. Breakfast and dinner will be provided in the lodges where you will be staying and lunch in one of the convenient local restaurants along the way. Food can vary and generally is a mix of some local dishes and continental food. If you have any restrictions, inform your guide in prior. Food is adequate but do not expect to much, as this is a trekking and will be minimal. You should always consider bringing your snack and energy bar from home or buy in Kathmandu. The major thing to watch is water. Be sure to drink bottled water at all times. Remember to stay well hydrated. It is very important in high altitude situations to drink at least 4 quarts of liquid a day, excluding tea. Always carry a bottle of purified water with you while touring or trekking . Although we will do our very best to adhere to the itinerary and its schedule, this itinerary should be considered an approximate indication of the schedule and scope of activities and trip routing. For the measures beyond our control like weather, flight, natural calamity, in such scenario, there may be alteration in hotels, itinerary, routing to accomodate changes. A few key points to remember. Even though we do our very best, it is important to acknowledge that some things are simply out of our control: weather, people and their concepts and culture. Hills people by nature are very laid back and take opportunities as they come and very rarely take the “bull by the horns” In Nepal, you simply have to hang loose, be open-minded, and allow the culture and experience to enhance your life. The best way to look at a trip is with an open mind. This is not to say that you should not expect good service. However, it does mean that you should be flexible and let things happen. John Steinbeck says it well: “We do not take a trip; a trip takes us” I hope this helps you keep in perspective the reason you visit the Himalayas is not really for the comfort and sophistication, but for its culture, nature and its people. Tipping is not included on your trip. Tipping is optional, and at times expected in travel trade. Obviously there is no limit to how much you can tip and some guests who enjoy and appreciate the services of Guides, driver and other crew will and have tipped much more than our average tipping guideline of about $10-15 per day. Valid passport (valid for six months after your date of entry into Asia) Optional: One other picture ID, such as driver’s license is useful (in case of emergency and for use as a substitute of passport or in case of loss of your passport) Photocopy of passport page to carry in wallet). Also bring along with you few extra copies of a passport size photos (colour or black& white). This may be required to provide at the check-points, when filling up forms. Bring extra passport size photos – Two passport size photo are required for obtaining TIMS permit. A few more of these are advised in case. Air tickets (Make copies of flight tickets and carry with you) you should bring the copy of your E-tickets and also bring copies of all other E-tickets along with you. Money (some cash and some in Traveler’s checks) Credit cards are accepted in high-end restaurants, shops and hotels in most major establishment in Katmandu. But whilst in trek, cash is imperative. Travel & Medical/Rescue Insurance (recommended). Bring the copy of your policy if you have purchased it. 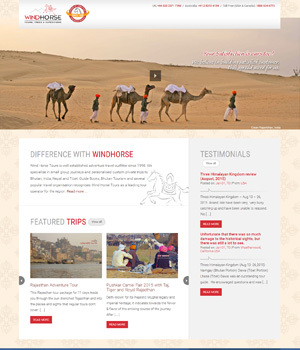 Following are very useful websites when planning or preparing for your trip. When you return from your trip, please share with us your feedbacks. Any photos and suggestions would means a lot to us. It helps to take stock of our delivery of our services. We look forward to hear from you upon return.